Figure 11.1. 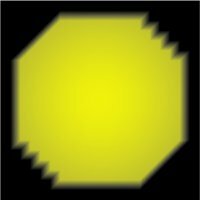 X3D lighting and rendering is made up of a light source, rays, geometric object surfaces, reflection, and the screen rendering that displays a user�s point of view (POV). Figure 11.2. Placement of background colors and images relative to the user�s viewpoint. Figure 11.3. 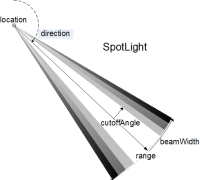 DirectionalLight provides a virtual light source where all rays are parallel. Figure 11.4. 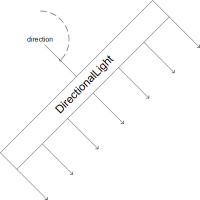 DirectionalLight nodes do not interact with objects to cast shadows, and distance does not decrease their intensity. Figure 11.5. 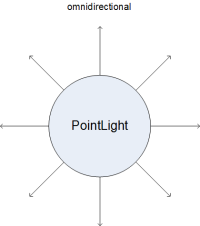 PointLight provides a virtual light source such that rays emanate radially in all directions from a single location. Figure 11.6. The PointLight example shows a 10�10 planar grid and includes unlit geometry (black) that is too far away from the light source to be illuminated. The sawtooth edges are an artifact of the triangulation of the illuminated planar grid. Figure 11.7. SpotLight provides a virtual light source such that rays emanate radially with a conical outline from a single location. Figure 11.8. 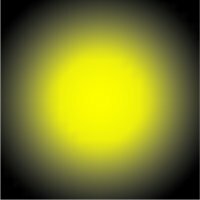 Central beam intensity and fall-off are visible in this SpotLight example. Figure 11.9. This Background example provides a seamless panorama of an ocean environment. Figure 11.10. A Fog node blends geometry colors and textures to the fog color.